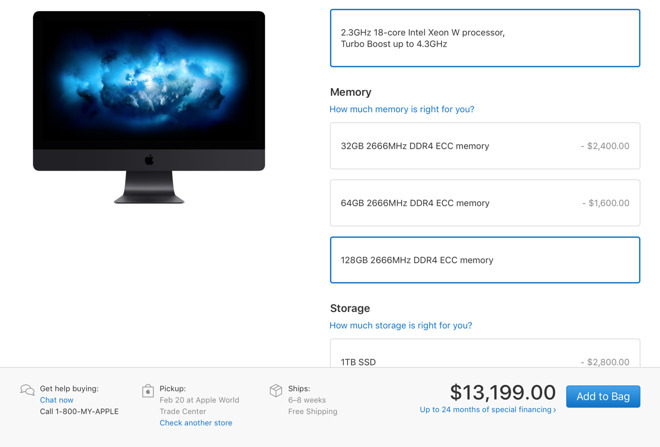 For $7,399, the 18-core iMac Pro has all other standard configurations, including 32 gigabytes of 2,666MHz DDR4 ECC RAM, a 1-terabyte solid-state drive, and a Radeon Pro Vega 56 graphics card with 8 gigabytes of HBM2 memory. A completely maxed-out, 18-core late 2017 iMac Pro will set buyers back $13,199 — and actually ships in early 2018. Just the 18-core processor upgrade will require customers to wait 6 to 8 weeks for it to ship, which would put the earliest deliveries in late January or into February. Apple's official app also says the machine will be available for in-store pickup starting Feb. 20. 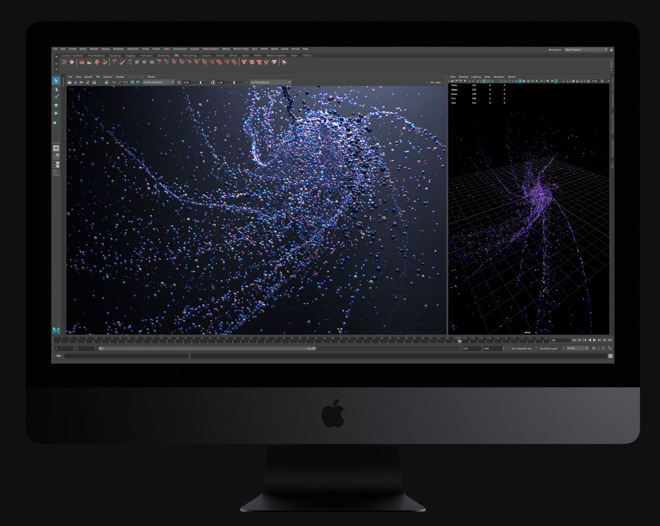 Custom configurations of the iMac Pro include 64 gigabytes of RAM for another $800, or 128 gigabytes for $an additional $2,400. A jump to a 2-terabyte SSD is $800, while 4 terabytes costs $2,800. Finally, the iMac Pro with Radeon Pro Vega 64 graphics card with16 gigabytes of memorytacks $600 onto the final price. With all of the internal configurations completely maxed out —18-core Intel Xeon processor, 128 gigabytes of RAM, 4-terabyte SSD and 16-gigabyte Radeon Pro Vega 64 — buyers will be set back $13,199. Like the base configuration 18-core model, it ships in 6 to 8 weeks and can be picked up in stores starting Feb. 20. At checkout, Apple also offers optional accessories and software, like the Magic Trackpad 2, a VESA Mount Adapter Kit, and a copy of Final Cut Pro X. Tacking on everything available brings the total bill to $13,926.98, before taxes. B&H Photo, an Apple authorized reseller, is also taking preorders for the 18-core iMac Pro with no tax on orders shipped outside NY and NJ.